A ring R is called right principally quasi-Baer (simply, right p.q.-Baer) if the right annihilator of every principal right ideal of R is generated by an idempotent. For a ring R, let G be a finite group of ring automorphisms of R. We denote the fixed ring of R under G by RG. In this work, we investigated the right p.q.-Baer property of fixed rings under finite group action. Assume that R is a semiprime ring with a finite group G of X-outer ring automorphisms of R. Then we show that: 1) If R is G-p.q.-Baer, then RG is p.q.-Baer; 2) If R is p.q.-Baer, then RG are p.q.-Baer. Throughout this paper all rings are associative with identity. Recall from  that a ring R is called right principally quasi-Baer (simply, right p.q.-Baer) if the right annihilator of every principal right ideal of R is generated, as a right ideal, by an idempotent of R. A left principally quasi-Baer (simply, left p.q.-Baer) ring is defined similarly. Right p.q.-Baer rings have been initially studied in . For more details on (right) p.q.-Baer rings, see [1-6]. Recall from  (see also ) that a ring R is called quasi-Baer if the right annihilator of every right ideal is generated, as a right ideal, by an idempotent of R. A ring R is called biregular if for each , for some central idempotent . We note that the class of right p.q.-Baer rings is a generalization of the classes of quasi-Baer rings and biregular rings. For a ring R, we use to denote a fixed maximal right ring of quotients of R. According to  an idempotent of a ring is called left (resp., right) semicentral if (resp., ) for all . Equivalently, an idempotent is left (resp., right) semicentral if and only if eR (resp., ) is a two-sided ideal of R. For a ring R, we let (resp., ) denote the set of all left (resp., right) semicentral idempotents. An idempotent of a ring is called semicentral reduced if . Recall from  that a ring R is called semicentral reduced if , i.e., 1 is a semicentral reduced idempotent of R.
For a nonempty subset X of a ring R, we use and to denote the right annihilator and the left annihilator of X in R, respectively. If R is a semiprime ring and I is a two-sided ideal of R, then . For a right R-module and a submodule N of M, we use and to denote that is essential in and is dense in , respectively. For a ring R, we let denote the group of ring automorphisms of R. Let be a subgroup of . For and , we let denote the image of r under g. We use to denote the fixed ring of R under G, that is . We begin with the following example. 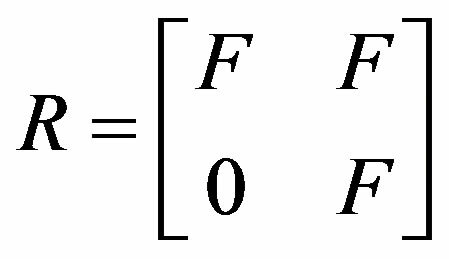 Then since the characteristic of F is 2. By computation we see that the idempotents of RG are only 0 and 1, thus RG is semicentral reduced. So if RG is right p.q.-Baer, then RG is a prime ring by [2, Lemma 4.2], a contradiction. Thus RG is not right p.q.-Baer.Also we can see that RG is not left p.q.-Baer. For , we claim that . Obviously . Conversely, if then . There exists such that . Therefore , , and . Thus , hence . Therefore . So if G is X-outer on R, then G can be considered as a group of ring automorph-ismms of and G is X-outer on . For more details for X-outer ring automorphisms of a ring, etc., see [10, p. 396] and . We say that a ring R has no nonzero n-torsion (n is a positive integer) if with implies . Let R be a semiprime ring and G a group of ring automorphisms of R. If is semiprime, then is semiprime. For a ring R, we use to denote the center of R.
Lemma 2.4. For a semiprime ring R, let G be a group of X-outer ring automorphisms of R.
Let with , 1 the identity of G, and .
. Hence . Also since for all , we have that . Lemma 2.5. Assume that R is a semiprime ring and G is a finite group of X-outer ring automorphisms of R. Then . Lemma 2.6. Assume that R is a semiprime ring and . Let be a two-sided ideal of R such that and with . Then .
. Thus . As , . We note that e and are in . So we have that . Lemma 2.7. Let R be a semiprime ring with a finite group G of X-outer ring automorphisms of R.
, with and , is a right R-homomorphism. Moreover . 2) The map defined by is a ring isomorphism. and , where is the restriction of to RG. Thus . For a ring R with a group G of ring automorphism of R, we say that a right ideal I of R is G-invariant if for every , where . Proposition 2.8. Let R be a semiprime ring. Then the followings are equivalent. 6) R is left p.q.-Baer. 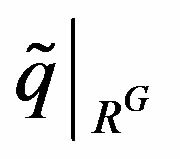 For a ring R with a group G of ring automorphisms of R, we say that a right ideal I of R is G-invariant if for every , where . Assume that R is a semiprime ring with a group G of ring automorphisms of R. We say that R is G-p.q.-Baer if the right annihilator of every finitely generated G-invariant two-sided ideal is generated by an idempotent, as a right ideal. By Proposition 8, if a ring R is semiprime p.q.- Baer with a group G of ring automorphisms of R, then R is G-p.q.-Baer. A ring R is called right Rickart if the right annihilator of each element is generated by an idempotent of R. A left Rickart ring is defined similarly. A ring R is called Rickart if R is both right and left Rickart. A ring R is said to be reduced if R has no nonzero nilpotent element. We note that reduced Rickart rings are p.q.-Baer rings. Let be the subring of generated by R and . 2) R is p.q.-Baer if and only if . With these preparations, in spite of Example 1, we have the following result for p.q.-Baer property of RG on a semiprime ring R for the case when G is finite and X-outer. 1) If R is G-p.q.-Baer, then RG is p.q.-Baer. 2) If R is reduced G-p.q.-Baer, then RG is Rickart. Proof. 1) Assume that R is G-p.q.-Baer. To show that RG is p.q.-Baer, it is enough to see that by Lemma 9 since RG is semiprime from Lemma 3. Let . Then , so by Lemma 7. From Lemma 9, there exists such that because . Note that . with . Then . So there exists such that . Hence . Put with and . Then . In this case, for all i. To see this, assume on the contrary that there is such that . Note that . Thus there exists such that because . As RaR is a G-invariant two-sided ideal of R and R is R-p.q.-Baer, there is such that . From , . As and , it follows that by Lemma 6, so . Therefore , and thus . So , and hence RG is p.q.-Baer by Lemma 9. 2) We recall that a reduced p.q.-Baer ring is Rickart. Thus if R is reduced G-p.q.-Baer, then RG is Rickart from 1). In , the quasi-Baer property of fixed rings under finite group actions on a semiprime ring and their applications to C*-algebras have been studied (see also [17,18]). Motivated by investigations in , in this paper we investigate the right p.q.-Baer property of fixed rings under finite group actions on a given semiprime ring. Assume that R is a semiprime ring with a finite group G of X-outer ring automorphisms of R. Then we show that if R is G-p.q.-Baer, then RG is p.q.-Baer. Thus if R is a semiprime p.q.-Baer ring with finite group G of X-outer ring automorphisms of R, then RG is p.q.-Baer. T. Y. Lam, “Lectures on Modules and Rings,” Springer, Berlin, 1998. M. Cohen, “Morita Context Related to Finite Automorphism Groups of Rings,” Pacific Journal of Mathematics, Vol. 98, No. 1, 1982, pp. 37-54. J. Osterburg and J. K. Park, “Morita Contexts and Quotient Rings of Fixed Rings,” Houston Journal of Mathematics, Vol. 10, 1984, pp. 75-80.